Hey everybody! 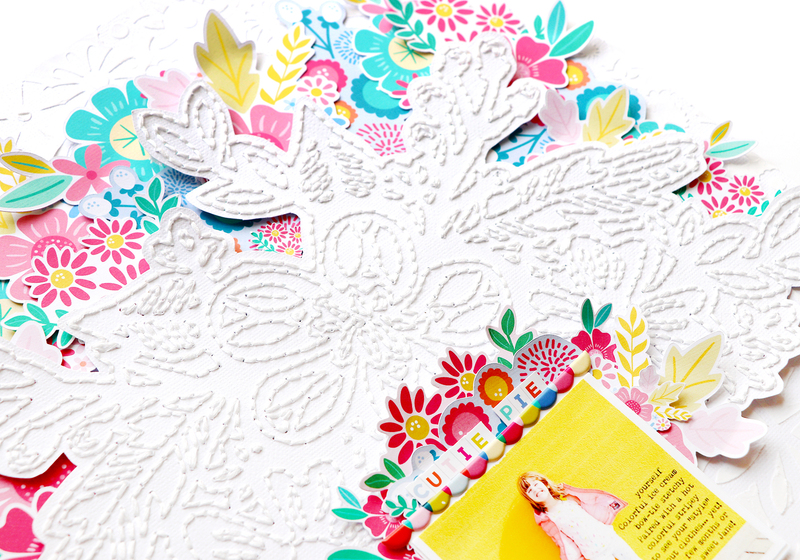 Today I have a new layout to share with you featuring some of my favorite techniques: hand stitching, lots of flowers, and something new: a modeling paste background! Scroll to the end of this post to find the process video to watch and see how this layout came together from start-to-finish. Over spring break we went on a road trip that involved over 30 hours of driving - to help pass the time between destinations I brought along some stitching projects, including this floral design which is a free cut file from Paper Issues! They have so many amazing (and did I mention FREE!) cut files, I highly recommend taking a look :) I used white thread to stitch on white cardstock to create a textured look. For a long time I thought about painting in the design, but the more I thought about it, the more I felt like it should stay white on white. But, I still needed COLOR! I love lots and lots of color. There are quite a few flowers from my Oh My Heart collection with Pink Paislee available in the Silhouette Design Store so I downloaded them, printed them, then used my Silhouette Cameo to cut them out! Easy peasy! To make the background I used an old KI Memories (remember them???) 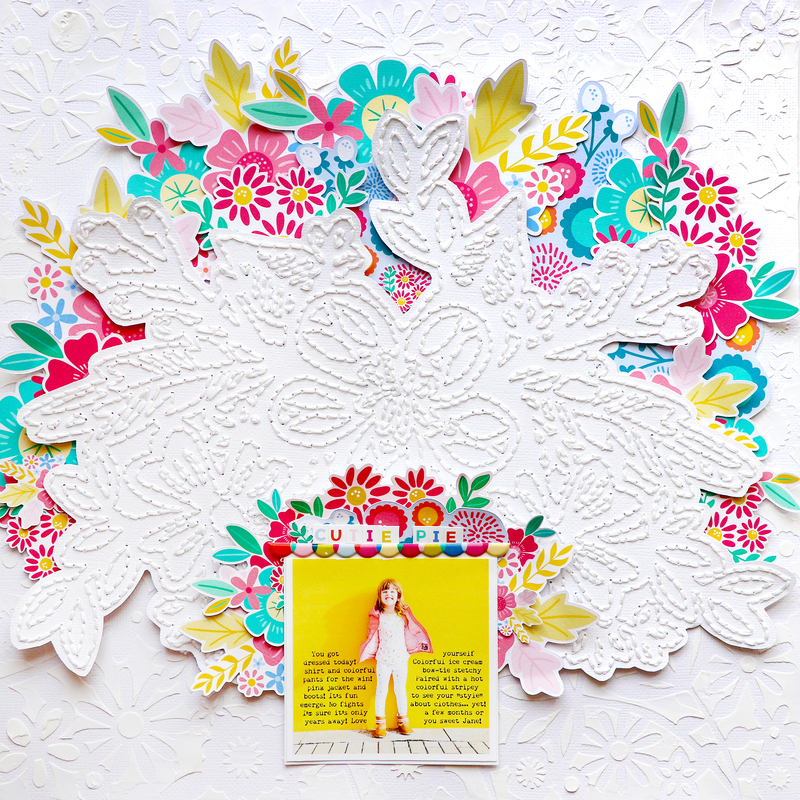 die cut background as a stencil along with modeling paste on white textured cardstock. I was going for lots of texture on this page! 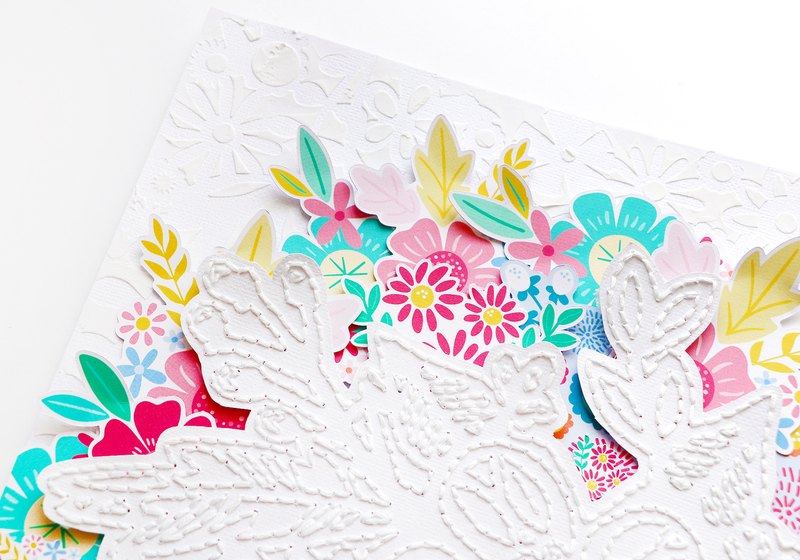 Once the paste dried I layered the stitched floral design on top then began tucking the die cut flowers underneath. I found a colorful photo, typed my journaling on the photo before printing, and then placed it at the bottom of the page. To help bring more focus to the photo I tucked even more flowers under the top. Thanks so much for stopping by today! 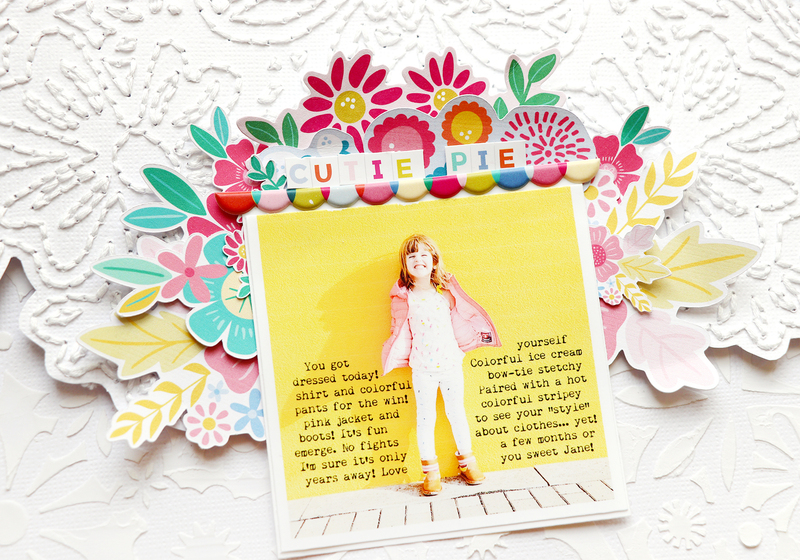 I hope you are inspired to create a fun and textured layout! Love love love love this! LOVING that adorable photo, the flowers and all that stitching!!!!!!!!!!!!!!!!!!!!!!! Wow!! Paige, your creativity is mind blowing!! Beautiful work!